Transitioning children from their Sunday School class to the adult service and sermon is challenging. Depending on the church size and format, this can happen anywhere between 4th grade and 8th grade. There aren’t many resources that help children, youth or high school students make the move to the sophistication of a sermon targeted to adults. 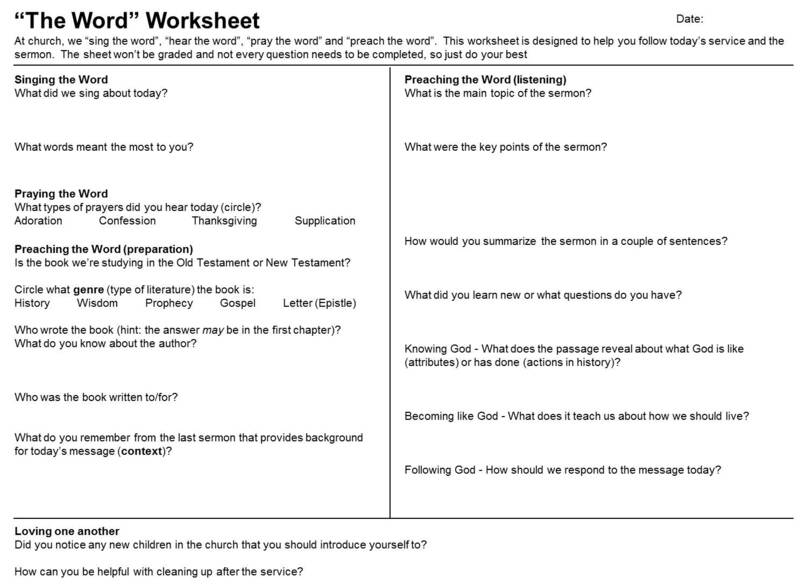 The page below is an attempt to create a youth sermon worksheet. It’s targeted for older middle schoolers or high schoolers, but can be simplified by removing some of the questions for a younger audience. The worksheet covers singing, praying and preaching the word of God as elements of the service. It assumes that you’ve taught some basic concepts of interpretation such as understanding the context and identifying the genre of a book, but that could be changed as well. The sermon is applied using the know, be, do structure for knowing God, becoming like Him and following Him. This entry was posted in Discipleship and tagged teaching children to listen to sermons, teaching students to take sermon notes, youth sermon notes. Bookmark the permalink.